Lessons | Kimchi with Eish! A Page where I will add some ideas for lessons and lessons that I have used. Some will be my own and others will be lessons I found on the intraweb! It’s that time of year and my Winter Camp is around the corner. I’ve been working on my materials for the camps for the past month. This winter I am doing 2 camps at my own school. Gr1 and Gr2 (Middle School). For the grade one’s I decided to a Harry Potter themed camp as the latest HP movie was released just over a week ago here in Korea. For the Grade two’s I decided to do a Shrek themed camp. Although I did create a few of the lessons from scratch many of them are borrowed from the internet. I did however create and redesigned all the worksheets. Even though I redesigned all the worksheets I can’t take any credit for this. This whole Shrek ESL was created by Brian Boyd. My co teacher asked me to do a lesson on time next week with my second graders. I decided to run then through the basics and then let them play a bomb game! Should be fun. Wow this took forever. And I did not even think of all the lessons myself. Some of them are mine but others I found on the oh so great Intraweb on sites like eatyorkimchi.com and waygook.org. Great sites! I went with an Anime them with all my worksheets and lessons. Each worksheet has a PPt that accompanies it but I am still fine tuning it. My summer camp is at my school and it;s for two weeks. This is just the program for the second graders. The program for the first graders will be uploaded as soon as I am done! phew! This was the first lesson. I started it off with the Earth song by MJ and let them stand up and sit down on the word “What”. This set the tone for the whole theme. When the video finished we had a discussion about the video and what they thought it was about. I then went into the lesson. I discussed the vocab with them and showed them pictures of the Nobel peace prize and previous winners. I asked them to identify the pictures and most of them guessed correctly. I then asked them why they thought this person won or should have won the Nobel Peace prize. I then let them write down some text in their notebooks and asked them to choose one of the people I had just discussed. They then had to present the text in their group. In this lesson I discussed Time magazines person of the year and how Time honors Great men and woman. I showed them some covers of time and let them guess who it was. I then let them create their own Person of the Year. It could be anyone. I printed a blank Time cover and gave them crayons. They then had to present it to the class. In this lesson I played “Who wants to be a millionaire” with them. I devided the class into two teams. As all the students have numbers my two teams were even and uneven numbers. I then called one person from the even team to the front and after that a person from the uneven team and so on and so forth. I asked them to choose the right answer. I explained the three lifelines to them. This worked really well and they all enjoyed it very much! This was the closing off lesson and I gave the students a worksheet on with the puzzles. I asked them to complete the puzzles. The fist one was a word scramble. The had to rearrange the letters so that it forms a word. They then had to decipher the word at the bottom. The second one was Fill in the missing words. I first read them the text and then played a voice clip of the text. Afterwards we went through the answers. The third puzzle is a crossword puzzle. And at the end I showed them a video of U2 as they didn’t know who they were. This is a lesson that I did with my 3rd grade middle school students. They really enjoyed it! 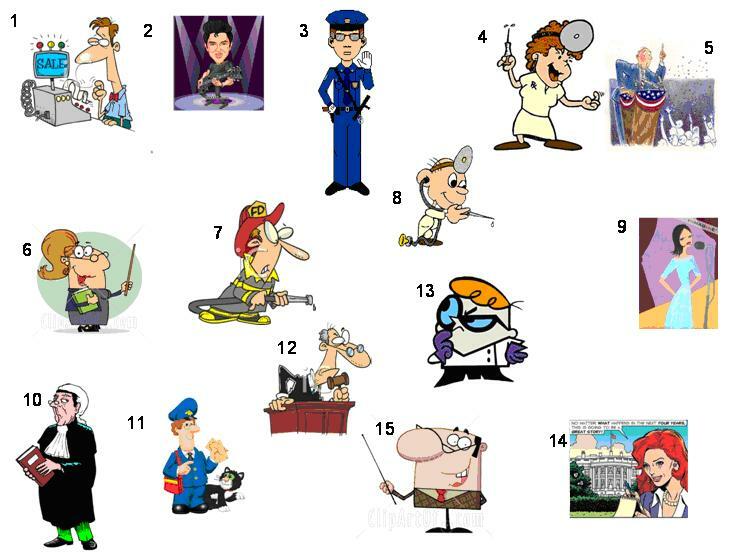 I gave them a handout that with 15 different cartoons on depicting various occupations. I explained to them that they must listen to a voice clip where I will describe the cartoons on the handout. I also gave each cartoon a name. Their task is to match the name with the right cartoon. They had to wright the name of the cartoon and its occupation, eg. Dan the Doctor. I had to play the voice clip twice and most students got everything right! After they completed the handout I gave them a puzzle containing all the words we had just done. For some other reason they are really excited about the puzzle. By the time everybody was done with the puzzle the period was over. Here is the powerpoint i made for this lesson! I’m going to give it a try for my teacher training classes.